Ask not why nobody is doing this. g0v is a decentralized civic tech community from Taiwan. for citizens to participate in public affairs from the bottom up. g0v aims to use technology in the interest of the public good, allowing citizens easy access to vital information and power to shape the civil society. Substituting the “o” with “0″ in gov, we want to use the Internet and digital thinking (0 & 1) to change the traditional “gov”. Opening up and making data public allows the people to take a closer look at politics and important issues. We build tools that empower people to evaluate their government and exert their democratic right to decide how politicians act. We have more than 1000 contributors, including 40% coders, 10% designers, 20% NGO workers and civil servants, and 30% citizens from all walks of life. As of mid-2016, we have held 22 bi-monthly hackathons, 2 international summits and regular meetups. g0v is a grassroots and decentralized community. Every participant proposes and decides what to work on. 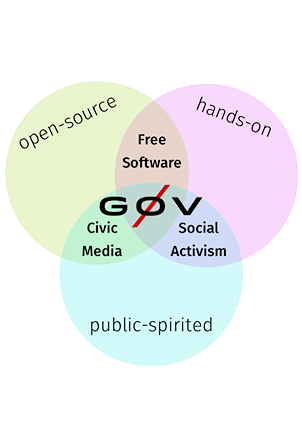 All projects are open source and built by citizens' spontaneous collaboration for public good. You can contribute to our hackathons and projects with your skills, ideas, time or donations. The project supercharges citizens with the power of visualization and social network to supervise government spending. It displays different perspectives of budget data like historical trend, cross-department comparison, public opinion and component breakdown of tax by government spending with interactive treemap, bubble chart and feedback mechanism. Hackfoldr is hacking briefcase. It is a tool developed to organize documents, websites, and online materials on one interface with a unified url. Users can set up and manage a hackfoldr simply by editing a Google spreadsheet. Hackfoldr has been used to manage hackathon projects, to provide a collaborative space for government agencies, and to serve as an information hub for events such as the Sunflower Movement and the Umbrella Revolution, among many others. As an improved version of Ministry of Education's online Dictionary at the beginning, Moedict has become the most popular online dictionary with million pages views per month and 100k mobile app users. It now includes Mandarin / Taiwanese / Hakka / English / French / Germany languages and information like character stroke order and pronunciation. In Taiwan, politician campaign finance data is only available in paper format. To open the data, this project conducted captcha-like game to crowdsourcing OCR on 2637 pages of Control Yuan's non-digitized version of political contributions data. Total 309k entries are translated into organized data and web API within 24 hours. Legislator Voting Guide helps citizens gain more information about what legislators did in the past with quantitative approach and visualizations. Legislators are sorted in various charts according to their records of absence, amount of legal proposal, etc. Their campaign websites and backgrounds are also provided for cross reference. To clarify the dispute over amendments to labor time regulations, the LSL Calculator calculates and visualizes amount of official holidays, minimum salary, and maximum overtime hours per week based on different proposed modification of the LSL ( Labor Standards Law ) through a unified interface. Workers can better understand their overtime pay and holiday compensation under different proposed modifications of the LSL to understand and review the impact of them. CC BY 4.0 g0v.tw contributors.